The yogis at Four Seasons Resort Maldives at Kuda Huraa will be enjoying a few lessons themselves this summer. Kat Harding – Australia’s first qualified Stand Up Paddleboard (SUP) yoga instructor – is coming island-side to train Kuda Huraa’s mat masters in the art of paddleboard-based poses. Kat will also be available for exclusive guest sessions from August 3 to 9, 2015, the week of the annual Four Seasons Maldives Surfing Champions Trophy: a WSL specialty event between six world champion surfers. 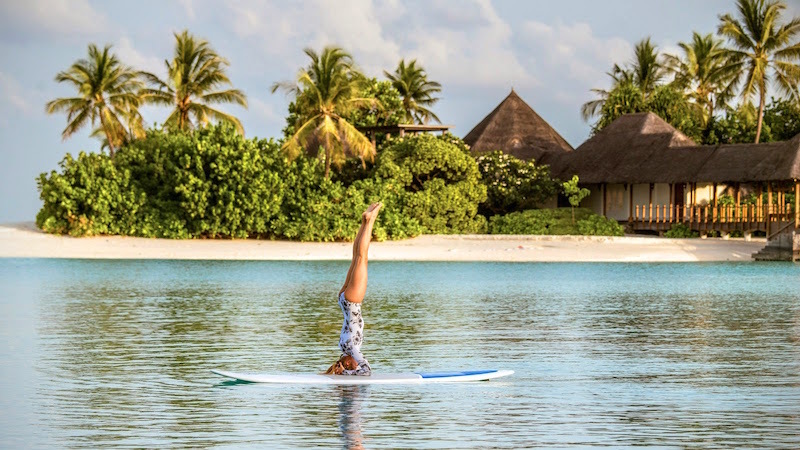 Doyenne of SUP yoga and all-round yoga guru, Kat Harding is set to unite – and elevate – Kuda Huraa’s surf and Spa offering, expanding the opportunity for guests to strengthen their connection, both within their core and with the ocean. While yoga’s origins date back thousands of years – and is practised to unite mind, body and spirit through breath – SUP Yoga is a relatively new hybrid, uniting yoga traditions with surfing and wellbeing through the paddleboard. It’s a discipline that engages the whole body, building strength, flexibility and focus while imparting an incredible sense of joy and freedom. Kat hails from Noosa, Australia – home of Kuda Huraa’s surf partners, Tropicsurf – continuing the surf pedigree and easy laid-back vibe that the Resort has become synonymous with. Kat’s own yoga journey began as a teen with a Christmas gift of a yoga DVD. Her love of movement flourished, inspiring her to travel and experiment with various yoga disciplines; train as a yoga teacher with Laxmi Yoga (Sally Parkes) in London and Spain; and go on to qualify as Australia’s first SUP yoga instructor. Trained in vinyasa, hatha, dynamic, yin and prana flow yoga, she combines her passions for yoga, surfing, healthy living and nature on the paddleboard. She’s also an ebook co-author, blogger, Fire and Shine luminary, Wanderlust Festival presenter and hosts Australia’s only luxury SUP yoga retreats.